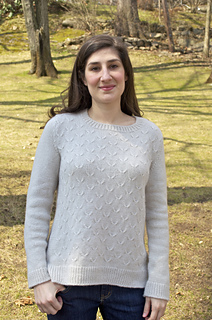 33 1⁄2 (36, 39, 41 1⁄2, 44 1⁄2, 47, 49 1⁄2, 52) "
Odette is a relaxed pullover with a hint of drape. 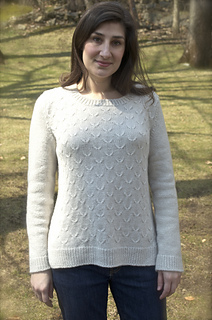 The body is worked in a slip-stitch pattern and the sleeves in stockinette stitch. Pieces are worked flat and seamed together. 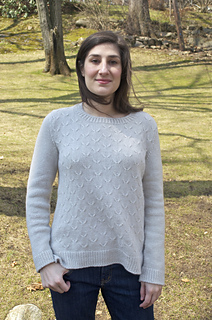 The sweater features full-fashioned shoulder shaping, a picked up neckband and a vented hem. Note: Pieces of sweater are worked flat; circular needle is used to accommodate large number of stitches and neckband knit in the round. 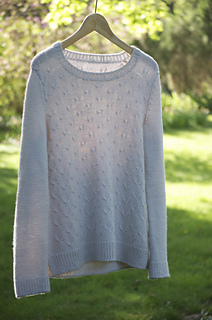 Straight needles may be used for sweater pieces if preferred. Sample shown is size 39” with 2 1⁄2” ease on model.